3D artist Misha Kovalenko recently shared a ZBrushCentral post showcasing the finished product of a job he was commissioned for. 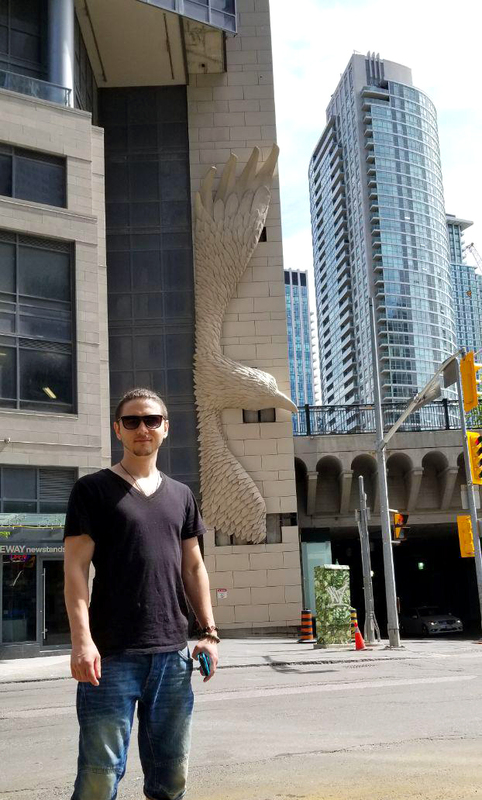 He designed this massive eagle in ZBrush which is now prominently displayed alongside a building in downtown Toronto. Misha shared his process and some background on the project which you can read below. Afterward, make sure to visit his ZBrushCentral thread to leave a comment and check out Misha’s website to see more work! Some time ago, I had the honour to work as a sculptor on The Eagle project owned by talented Toronto artist Dean Drever. It was a very challenging and exciting opportunity for me to create a sculpture which stands about 50 feet tall and located in the heart of the largest city in Canada, Toronto. The main artistic challenge here was to capture a realistic look of the Eagle while keeping more of a stylized design. 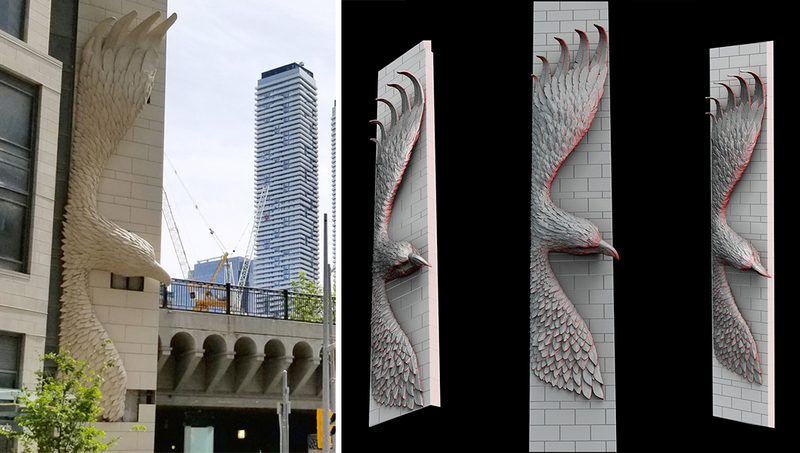 Public art like The Eagle has the ability to create character and identity by celebrating the history, character, identity and creativity of the area and its people. Knowing right away that during this project I will be working with feathers a lot I started out by gathering various reference materials. While sculpting head and wings I did not really use any modified or custom brushes which is a good example of how the ZBrush default tool set up is so powerful that it can be enough to complete a project of this scale without any customization. Once a base shape was established and approved, I modeled several different sets of feathers in ‘’ZModeler” and then placed and adjusted them manually. I opted to not use procedural tools as the goal was to give the Eagle more of an organic look with all of its imperfections. I really like using ‘’ZModeler” in my work as in my opinion is it is very quick and flexible modeling tool yet it can be pretty powerful if the one spends enough time learning it. At some point towards the end of sculpting stage, when I already had a solid mesh a couple of design elements had to be changed and this was where the “Move Topological” Brush came in extremely handy. At that time “The Eagle” was my first project done in 4R8 version and I had a chance to test out new features literally on the go. The combination of new Gizmo and old Transpose tools worked very well for me. There were many things to keep in mind when working on such large structure. One of them was wind study report which required an upper wing and long feather to have a certain curvature angle. The needed angle was achieved by using the amazing flexibility of various move brush tools. Once the final design was approved, I worked closely with an architectural engineer and was responsible for making adjustments to ensure that it meets engineering requirements. Overall it was a great and very inspiring experience despite a huge amount of responsibility and multiple technical and artistic challenges along the way I definitely look forward to working on similar projects in the future. The Eagle Sculpture, in my opinion, is a great example of how ZBrush can be used not only in game dev, movies, collectables etc. but also in traditional sculpture as it brings absolutely new, enhanced feel and approach to traditional art. Basically, with proper planning and professionals on board, ZBrush makes it possible to bring very ambitious projects to life.